Mercy Investments and other members of the Interfaith Center on Corporate Responsibility—many of them with close ties to healthcare providers on the front line treating overdoses—and the UAW Retirees’ Medical Benefits Trust started a rapidly growing coalition in summer 2017 to address the opioid crisis. ICCR officially launched Investors for Opioid Accountability (IOA) in October 2017 and now has support from institutional investors with more than $2.2 trillion in assets under management. They are joined by state treasurers and other institutional investors including many trade unions. The campaign uses a corporate governance lens and focuses on the role of major drug makers, distributors and treatment manufacturers and calls for more transparency and accountability from publicly traded companies about clear business risks that are manifesting in lawsuits, legislation and reputational damage. the governance measures AmerisourceBergen has implemented since 2012 to more effectively monitor and manage financial and reputational risks related to the opioid crisis in the U.S., given AmerisourceBergen’s distribution of opioid medications, including whether AmerisourceBergen has assigned responsibility for such monitoring to the Board or one or more Board committees, revised senior executive compensation metrics or policies, adopted or changed mechanisms for obtaining input from stakeholders, or altered policies or processes regarding company political activities. The proponents want the company to provide more information about its response to the epidemic given the role it plays as the second largest pharmaceutical distributor in the United States. 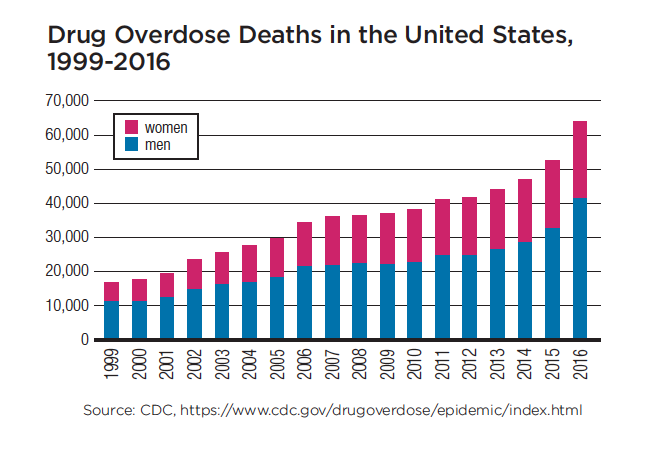 In the body of the resolution, they recap key elements of the complex problem but say the company is uniquely situated to act because of its major role as a distributor, what they call a “choke point” in the chain of use and abuse that is taking so many lives (see bar chart). As an example, they cite evidence gathered by an investigative journalist in West Virginia who reported that AmerisourceBergen shipped tens of millions of hydrocodone and oxycodone pills to small town pharmacies in West Virginia, apparently contravening its risk management system. The company contends its current risk management and oversight approach is sufficient but notes a $16 million litigation settlement last year related to opioids. In addition to the report request at AmerisourceBergen, which IOA members also filed at Irish-based Mallinckrodt, the coalition is asking companies to tie executive compensation to adopt executive bonus clawback policies after material fines associated with opioid litigation and to put in place independent directors and separate the chair and CEO positions. These governance proposals are beyond the scope of Proxy Preview but are described in more detail in ICCR’s 2018 Proxy Resolutions and Voting Guide publication. J&J currently manufacturers an opioid pain medication (Duragesic) through its subsidiary Janssen Pharmaceuticals which contains fentanyl. As you may know from the news, this type of product is wreaking havoc across the US. Just my state (Ohio) alone has over 200,000 addicts and the number is growing rapidly. I would like to get an advisory view from the shareholders regarding the appropriateness of this product. Vote CONTINUE if you think J&J should continue to manufacturer this product. Vote STOP if you think J&J should cease manufacture of this highly addictive pain medication. SEC staff agreed it can be excluded because its format is “not a proposal within the meaning” of the shareholder proposal rule. J&J also argued it dealt with ordinary business, about which the SEC did not comment. on the risks to [the company] from rising pressure to contain U.S. prescription drug prices, including the likelihood and potential impact of those risks as applied to [the company], the steps [the company]is taking to mitigate or manage those risks and the Board’s oversight role. The report should address risks created by payer cost-effectiveness analysis, patient access concerns, outcomes-based pricing, and price sensitivity of prescribers, payers and patients. Pfizer is contending at the SEC that it concerns ordinary business since it is too detailed, and moot given the work and reports from its Board Regulatory and Compliance Committee, as disclosed in securities filings. The SEC has yet to respond. A long-time shareholder proponent on tobacco resolutions, Father Michael Crosby, died in 2017, and this year just one resolution on tobacco is now pending, before Altria, asking it to “take steps to preserve the health of its tobacco-using customers by making available to them information on the nicotine levels for each of our cigarette brands and begin reducing nicotine levels in our brands to a less addictive level.” The resolution is new. the Company’s position as to how the Foundation’s work relates to the business of the Company. The proponents were concerned that the Foundation for a Smoke-Free World, which received $80 million in startup funding from the company, might be unduly influenced by it despite assertions from the company to the contrary. ICCR reports the company agreed to meet and will allow proponents to make a statement at its annual meeting, so they withdrew. A new proponent, the Flyers Rights Education Fund, wants two airlines—American Airlines and United Continental—to report “on the regulatory risk and discriminatory effects of smaller cabin seat sizes on overweight, obese, and tall passengers. This report will also analyze the impact of smaller cabin seat sizes on the Company’s profit margin and stock price.” Both companies contend at the SEC that it concerns ordinary business, since it relates to how the airline provides its air transport services. The argument is likely to succeed, although the SEC has yet to weigh in. In a novel resolution, individual Martin Harangozo suggested that Ford Motor report, “outlining the costs and benefits of feeding its employees, with the intention to promote health, productivity, and profitability.” The new resolution suggested Ford’s bottom line would be improved if it were to provide three meals a day to employees, consisting of “hot oatmeal and bananas, raw spinach salad with grapes” and “red cabbage carrot coleslaw,” with a link to a specific recipe. The company successfully challenged the resolution at the SEC, which agreed it can be omitted on ordinary business grounds. One other resolution on health issues may go to a vote, at Dr Pepper Snapple Group. Trinity Health asks it to report “on company-wide efforts to address the risks relate to obesity. The report should include aggressive quantitative metrics around reduction of added sugars in its products and development of healthier product offerings.” The resolution is new to the company and so far no challenge has surfaced at the SEC, so it may go to a vote.